©1999 C.J. 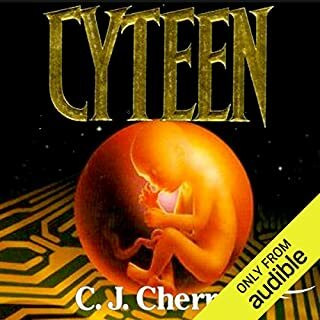 Cherryh (P)2012 Audible, Inc.
STORY (sci-fi) - I can't begin to describe everything that happens in this book. It's #4 in a series of 15 books, and it's my favorite so far by a longshot! Bren Cameron (main character) is a human translator/negotiator who lives among the Atevi, an intelligent, peaceful alien species. 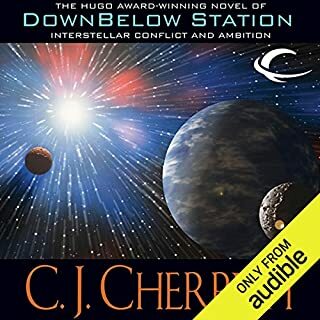 In this book, Bren and a small group of Atevi travel to a human space station orbiting the Atevi's home planet to negotiate peaceful coexistence while making repairs to the station. They enter a political mess onboard the station, and there's one crisis after another. Too much to begin to describe here, but there's lots of action and suspense and it's also very mentally stimulating. I listened every spare minute I could and was intrigued every second. CJ Cherryh is a genius! The world she's created, the culture of the Atevi, and I don't know how in the world she came up with everything that went on in this book. The suspense was palpable and the action was exciting, but it didn't rise to the level I would consider "for guys only." PERFORMANCE - Great job, great voice distinction among many characters. Lots of strange alien pronunciations to keep straight, which he did. He has a distinctive style of reading, the way he pauses throughout sentences, but it's perfect for this book. OVERALL - Highly recommended for mature males and females. No cursing. A very small amount of vague sexual references. Definitely don't start in the middle of this series because it has a lot of it's own language that would be hard to pick up midstream. Also, the story line builds with each book so you will want that history, but each book ends at a good stopping point where the issues in that particular book are resolved. 3 Years have passed!! )-: !!!! Shuttle was built, second is on it's way. NEW INTRIGUES AND NEW NEGOTIATIONS!!!! This book is conttinuation of the story line, it's not a sequel!!! Daniel Thomas May's performance is outstanding. It's insightful and compelling, going beyond just making all the book's vivid characters distinct and memorable. This book is at least as good as the first three. 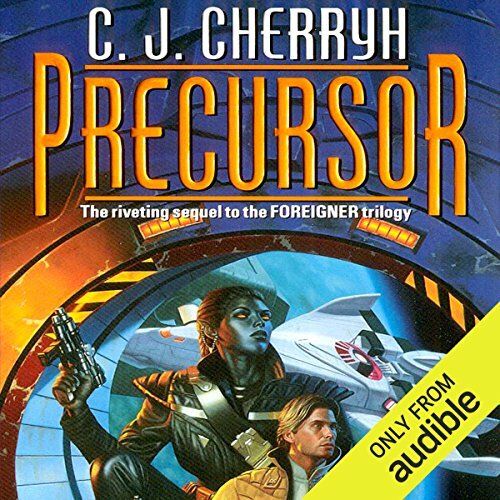 In fact, I thought Precursor had even more action and suspense than the first three volumes. It introduces people and places of great interest. And the plot takes surprising twists that sometimes made me cheer out loud. I admire how well Cherryh makes each book a complete, satisfying whole. These are NOT cliff-hangers. Each book resolves its story's issues. (Well, so far, at least. I can't swear about the rest of them.) Each book is a complete novel, but they all tie together, and it's worth reading them in the correct sequence. 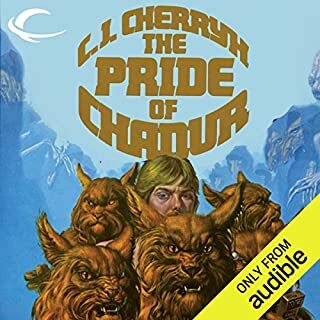 Audible has released the first six of the 14 books in this series. (The hard-back of volume 14 is due to be released in April.) 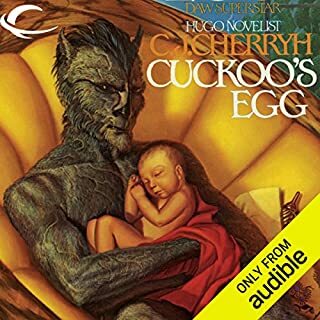 I hope Audible quickly adds the other eight! Didn't carry the story as good as others. Fifteen words is too much for this book. Addictive, FANTASTIC narration, SUPUPERB narration, heartfelt thanks! Would love to listen the night away & HAVE! What did you love best about Precursor? I should note that this is the 4th book in the series. As I write this review I just finished the 8th book into this series. And I have enjoyed them one after the other, not wishing to leave the flow of the story as it unfolds. How much more of an endorsement can I provide? And it is hard to say exactly what it is that draw me into the story line so strongly that I have already purchased the 9th book and am eager to start it. I would strongly recommend the reader go back to the first book in the first series and enjoy them in order. You can start here and you will enjoy the books but there are many references to earlier books. Having not read them will not interfere with your enjoyment, but having read them you will enjoy this one more. Half of the book, each book in the series occurs inside the head of Bren Cameron, the main character. 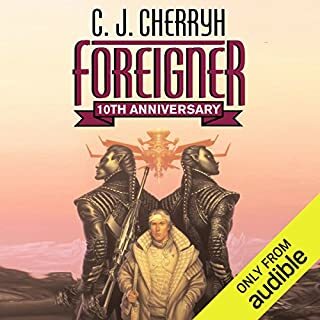 We hear his thoughts and the struggle he faces as he tries to reconcile his human self with the foreign, alien society that has become his home an his world. Perhaps that is the attraction. I find myself projecting myself into his position. I am engaged in the situation, not just an observer, and perhaps that is what has me so eager to continue the story. Politics and intrigue based on a set of social norms and societal imperatives that are familiar but not exactly the same as what we experience or understand as human. This near miss understanding, this near miss alignment is really the thrust of the entire series and I am thoroughly enjoying it. If you are looking for a lot of action and explosions and battles the this might not be a series for you. But if you enjoy being intellectually engaged in the story, wondering how you would respond, then you should find yourself as addicted as I am. Daniel May's performance is wonderful and brings the story and the characters to life. All the series is magnificent! Absolutely stunning. The narration is perfectly on point and the series is great. Every book fantastic. Can not stop listening to it. This is a series that should be read/heard in order. Just know that it gets better as the series progresses. Daniel May's narration is first-rate. I haven't heard him outside of this series, but so far, he has been great. He provides consistent rendering of both male and female parts in a believable way. 800 ish pages in and this thing shifts into even higher gear. I love it! Well this is the second "Sequence" of books and it consists of again 3 books that are really just 1 long book so this review is going to be for all 3 books. This is a great sequence or "Arc" as it is really called and it is actually better than the first one. 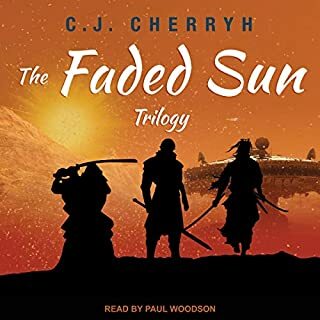 This focuses on Bren going to Space aboard the ship Phoenix with Cajeiri (a young boy the heir to the ruler of the planet Tabini), and Ilisidi (the young boys great grandmother) they go and check out what the ship has been doing for the last 200 years it was away. There is some problems on the ship and more when they get to the other space station, but after meeting the Aliens things get pretty cool and this sequence finishes out nicely although you know there is something going on you must know about so you go on to get the next set of books.